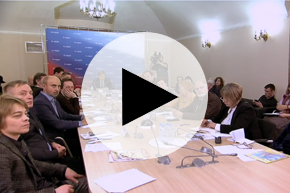 The video tells about the round table, held on January 12, 2018 in the Presidential Library. The event was devoted to the prospects for the development of children's and youth media. Video editors, editors, publishers, and creative media professionals focused on children and young people ("5 Corners", "Koster", "Bus", "Pionerskaya Pravda", " Youth, "Murzilka", "Funny Pictures", "Children's novel-newspaper" and others); journalists starting their professional career as cadets; representatives of the school, student and library communities, public authorities from St. Petersburg, Moscow and Tyumen . I. Yevseyev, Marina Igorevna. Ii. Yarosh, Vladimir Mikhailovich. Iii. Raytsev, Nikolai Yakovlevich. Iv. Osin, Andrey Alekseevich. V. Khudyakova, Alexandra Sergeevna. Vi. Presidential Library (St. Petersburg) .1. Presidential Library (St. Petersburg, city) - Events - 2018 - Multimedia publications. 2. The people (collection). 3. Children's magazines - Russian Federation - Multimedia publications. 4. Youth magazines - Russian Federation - Multimedia publications. 5. Journalism - Russian Federation - Multimedia publications. 6. Media and Society - Russian Federation - Multimedia publications.